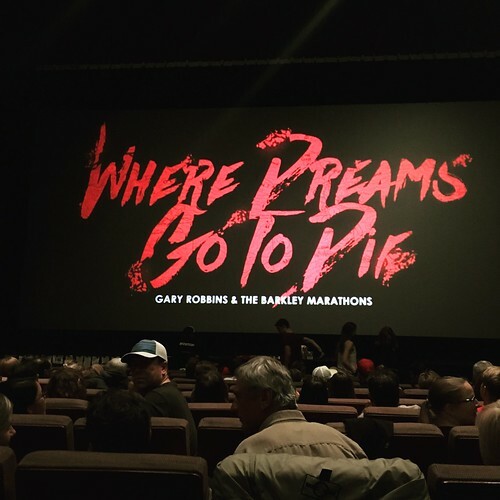 In my last post I mentioned that we capped off the 2017 Scotiabank Toronto Waterfront Marathon (STWM) by attending the Where Dreams Go To Die premiere. I wanted to take sometime to write about the premiere, but before doing that I need to backtrack a little. 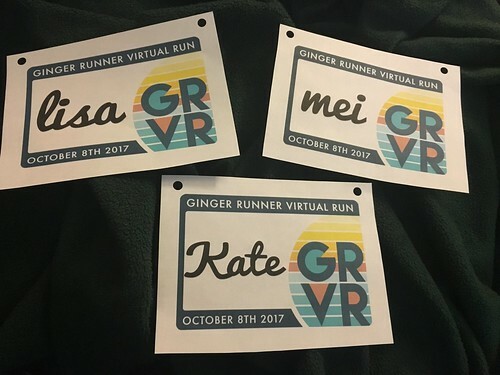 A few weeks before STWM, I spent Canadian Thanksgiving weekend participating in the Ginger Runner Virtual Run (#GRVR17) with Kate and Lisa. This was Ethan Newberry (The Ginger Runner) and his wife Kim (Mile Long Legs)’s second year of organizing the virtual run. This year it was on held on Oct. 8 and participants worldwide ran (in their own time zone) for up to two hours. We tracked our run in Strava and then submitted it to Ethan for a chance to win prizes. There was also the option to make a video for a prize, so I figured I’d give it a try. The run can take place as part of another organized run (e.g., group run, a race, etc.) or as an individual run. It’s up to you. 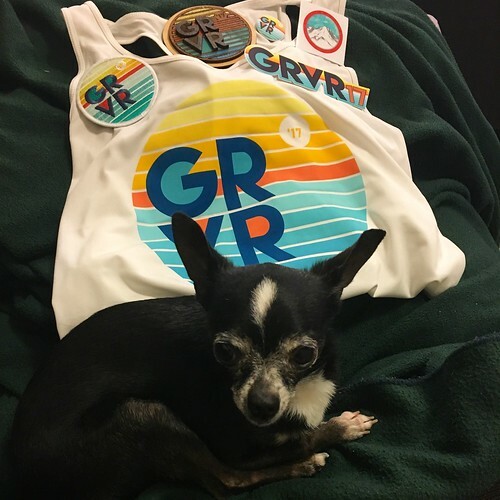 Daisy with my #GRVR race kit. There were two options for registration: 1. Digital only (no shirt or swag) for $6 or 2. Race kit. The race kit included a singlet, locally made magnet, badge, stickers and a button. 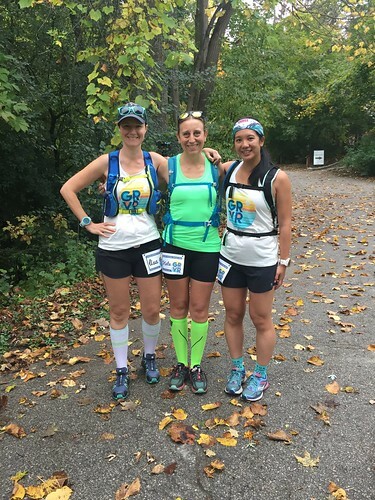 Since 5 Peaks Trail Run series was holding an orientation run at the Kortright Centre for Conservation on the same day we decided to use it as part of our #GRVR17 run. Some of my friends went to the orientation run for Heart Lake and had lots of fun, a chance to check out the race course in advance, connect with other trail runners and the opportunity to win swag (I love swag!). It was unseasonably warm that day so I was able to wear shorts and a singlet (not typical running gear during Canadian Thanksgiving weekend). The other runners had questions about what we were doing since we had #GRVR17 race bibs on. Lisa explained that we don’t ordinarily bring our own race bibs out to runs! We took a few pictures and then the 5 Peaks Trail Crew led us on the run. All registrants received digital race bibs that they could customize, print and wear. Showing off our race bibs. Lisa, Kate and I ready to run! Ethan also asked all participants to film a 5 second clip of themselves saying there name and where they were for his #GRVR17 video compilation. We were excited to see ourselves included in the final video! 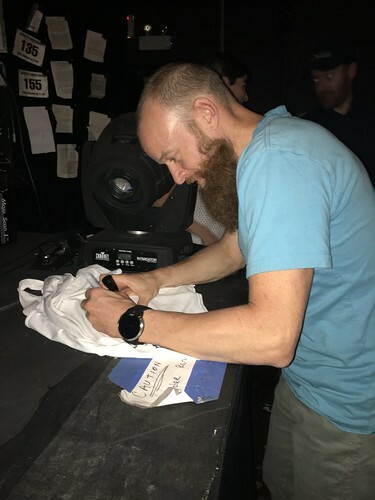 I’ve been a fan of Canadian trail ultra-runner Gary Robbins since Ethan’s Wonderland – documenting Gary’s record-breaking run around Mount Ranier. 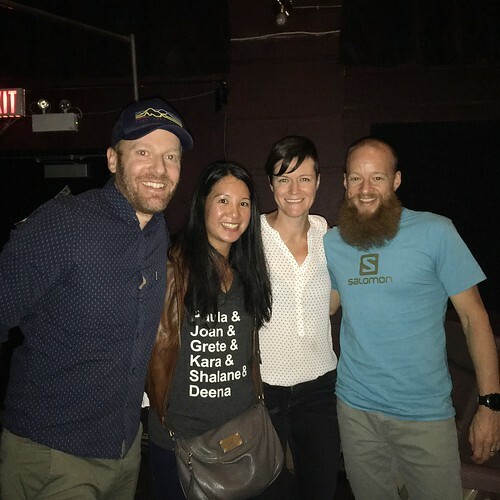 My friends and I were excited to hear that Ethan and Gary were making a stop in Toronto during their tour of Where Dreams Go To Die – a film chronicling Gary’s first two attempts at the Barkley Marathon. The Toronto tour stop taking place on the same day as STWM was the cherry on top. I got to run with my friends and later celebrate together at Where Dreams Go To Die. Who could ask for anything more? Dan and I met with up with Lisa and Ash and sat together in the theatre. We also ran into Cliff, Jennifer, Kate, Leanne and Michelle. 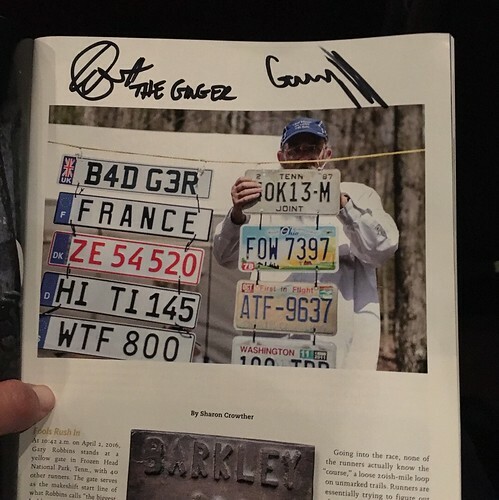 Before the screening, Lisa and I both tweeted to Etahn and Gary that we were hoping to meet them and get them to sign her singlet and my Canadian Running magazine. I loved how honest it was and how comfortable Gary was with showing his vulnerability, especially considering how public his second attempt was. I loved how much his wife (who is also an accomplished ultra-runner), Linda Barton Robbins supported and believed in him. At the same time I really admired Gary’s strength and tenacity and even though he hasn’t officially completed the 5th loop, the film left me feeling optimistic and inspired. I also thought Ethan did an amazing job capturing these two attempts. It was both intense, but appropriately lighthearted and funny at times. It struck the right balance between these elements while also telling a good story. Waiting for the screening of Where Dreams Go To Die to start. After the screening there was a short break so Lisa and I ran up to the line up that had formed for a chance to meet and take pictures with Gary and Ethan. I loved watching them interact with other audience members. They took their time chatting to everyone and never looked rushed. As we were waiting for our turn to meet them, Jennifer ran up and offered to take pictures for us. Ethan and Gary were so nice! We mentioned our video to them and Ethan remembered it. They also signed Lisa’s singlet and my Canadian Running Magazine. It was easily one of the highlights of my day. Gary signing Lisa’s #GRVR17 singlet. 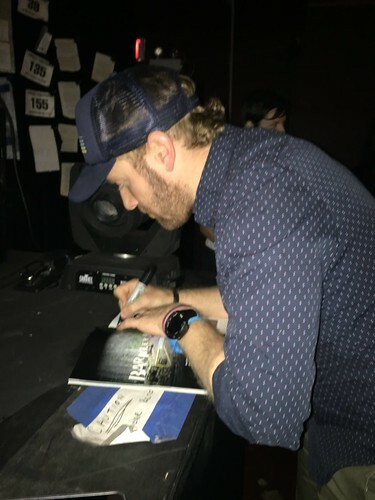 Ethan signing my copy of Canadian Running’s article on Gary and the Barkley Marathons. 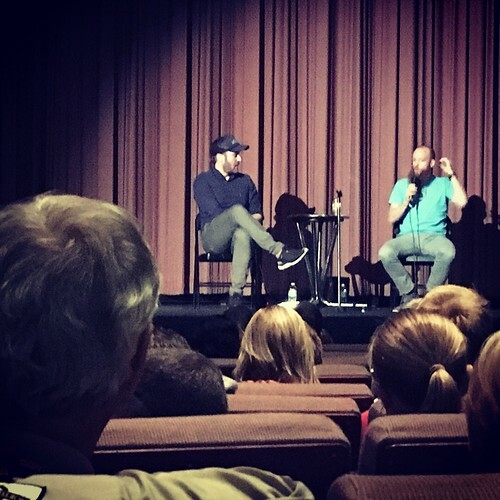 Next there was a Q&A session with Gary and Ethan. People who asked questions could win a prize (including a Suunto watch). They had also asked people to submit questions in advance. 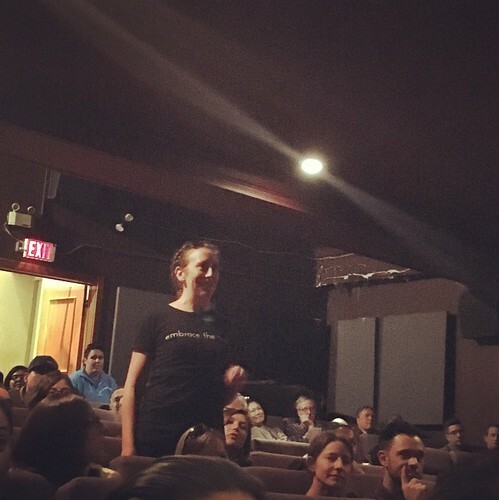 Kate’s question was picked and she got to stand up and ask it. Kate won a pair of socks (seems fitting given that Kate is known for her awesome running socks, though I was hoping she’d win the Suunto watch). Kate asking her question about fear. Ethan and Gary during the Q&A. Gary also shared some of his running mantras with us. I wrote them all down and have found myself repeating some of them myself. I’m hoping to use some of them in 2018. 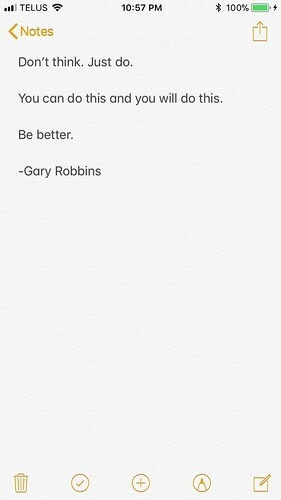 A screenshot of my notes on Gary’s mantras: Don’t think. Just do. ; You can do this and you will do this. ; Be better. We left the premiere feeling excited and ready to tackle new challenges. My key takeaway from Gary and Ethan was that sometimes things don’t go as planned or workout the first time. Sometimes you fail and in Gary’s case, it was very public. Instead of dwelling on the what ifs, he is moving forward to what’s next. He’s committed to finishing the Barkley Marathons and you can see the drive on his face. I know he’s going to do it. Overall it was a really great event and I’m glad we had the opportunity to see the premiere and meet Gary and Ethan. It was the perfect way to end STWM race weekend!